Description: Herb to c. 35 cm high; corm 12–18 mm diam. Leaf solitary, inserted above ground level, longer than scape, 4–10 mm wide. 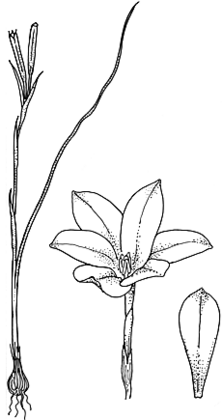 Scape simple or few-branched; stem bracts 2–4 cm long; outer spathe 3–4 mm long, inner 4–8 cm long. Perianth pale yellow or salmon-pink; tepals similar, obovate, 25–35 mm long, the claws forming a narrow cup c. 10 mm wide. Filaments fused into a tube 6–7 mm long, minutely hairy below; anthers 5–6 mm long, coherent below, slightly diverging above. Style with crests short, c. 1 mm long, erect to incurved. Capsule mostly 3–4 cm long with a short obtuse beak c. 1 mm long. Distribution and occurrence: Occasionally naturalized, weed of disturbed sites; from Maitland to western Sydney. Native of S Afr.